Maximum Living's MineralRich contains the proper proportions of naturally occurring elements like calcium for your muscles, boron for your bones, and silica for your skin--all in a great-tasting liquid that ensures rapid absorption. 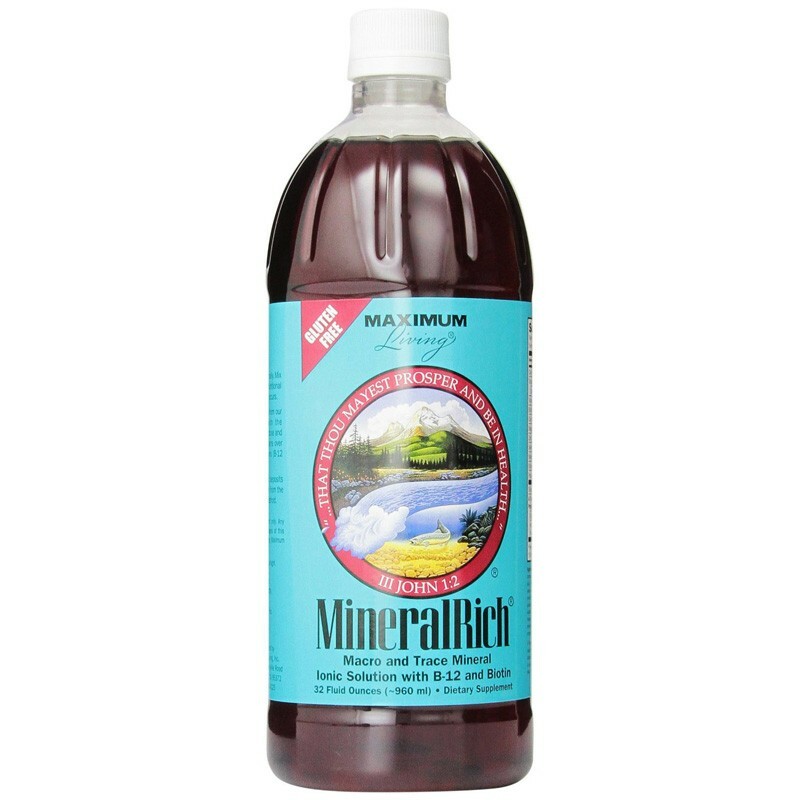 MineralRich is a liquid mineral supplement that provides nature?s balanced blend of over 70 trace minerals, essential minerals, combined with vitamins B-12 and biotin, in solution for effective and rapid absorption. Delivering a broad range of nutritional support, MineralRich contains proportionate amounts of naturally occurring elements like magnesium for muscles, calcium and boron for strong bones and teeth; along with copper, zinc and silica for healthy hair, skin and nails. Purified water, naturally sourced pure fructose, magnesium complex (magnesium sulfate, magnesium citrate, magnesium gluconate), citric acid, calcium complex (calcium levulinate, calcium sulfate, calcium citrate, dicalcium phosphate), zinc complex (zinc sulfate, zinc citrate, zinc gluconate), sodium benzoate (as a preservative), potassium complex (potassium chloride, potassium citrate, potassium gluconate), manganese complex (manganese sulfate, manganese citrate), caramel colour, wild cherry flavour with other natural fruit extracts, sodium metasilicate, cyanocobalamin, chromium complex (chromium chloride, chromium picolinate), biotin, selenium complex (sodium selenite, selenomethionine). Take 1 oz. (2 tbsp.) daily. Mix or follow with an 8 oz. glass of water.